The three series that resume action in the underdog's city for Game 3 haven't been all that dramatic yet as the home team never was much in doubt of losing either of the first two games. I think it's fair to say that if the home dogs don't win Game 3 on Thursday night then we probably are looking sweeps -- especially the Celtics and Pelicans need to win Game 3 against the two best teams in the NBA. I do think the Bucks will get one game from Chicago, which just can't seem to keep everyone healthy and is dealing with yet another injury. Boston has played a bit better than I expected in the first two games. Normally if you hold the prolific Cavs under 100 as the C's did on Tuesday then you have a good chance of winning because Cleveland isn't great on defense. However, the Cavs won 99-91. Boston just doesn't have anyone to deal with LeBron James (30 points) or Kyrie Irving (26). James passed Jerry West as the seventh-leading scorer in NBA playoff history. LeBron has a ways to go to catch No. 1 Michael Jordan, but it seems like he will eventually. James and Irving combined for Cleveland's final 28 points. The Celtics starters combined for just 40 points, with Tyler Zeller leading the way with 11. That's obviously not going to cut it. Boston shot only 38.8 percent and was outrebounded by eight. Thanks to Isaiah Thomas' 22 points, the Boston bench outscored Cleveland's 51-7. But if your starters are getting demolished, that's little consolation. Boston has been dominated in the third quarter of both games; on Tuesday it was a 17-4 run that put the C's into a 14-point hole. Maybe the Celtics should just keep Kelly Olynyk on the floor. They outscored Cleveland by 13 points during his 21 minutes in Game 2. Updated series line: Cavaliers -25000, Celtics +5000. 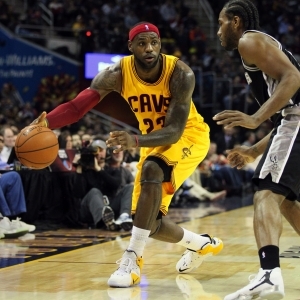 Key trends: The Cavs are 0-6 against the spread in their past six playing on one day of rest. The Celtics are 5-1 ATS in their past six at home vs. teams with a winning road record. The "over/under" has gone over in 10 of Cleveland's past 11 road games vs. teams with a winning home record. Early lean: Cavaliers and over. Chicago improved to 5-1 against Milwaukee this season with a 91-82 win on Monday that was a bit tougher than the 103-91 Game 1 win. The Bulls had just 11 points after one quarter Monday and were only up three entering the fourth. Jimmy Butler followed his career playoff high of 25 points in Game 1 with 31 points (14 in the fourth quarter) in 46 minutes in Game 2. Coach Tom Thibodeau just never learns -- he keeps riding his guys so many minutes. Butler also had nine rebounds and nary a turnover. Derrick Rose was very quiet in the first half (0-for-7 from field) but finished with 15 points, nine assists and seven rebounds in 38 minutes, his most played by far since returning from his knee surgery. The news wasn't all good as rookie sensation Nikola Mirotic suffered a strained left quad and bruised knee and probably won't play in Game 3 or maybe not Game 4, either. He was injured during a skirmish with Milwaukee's Zaza Pachulia. There were a few scrums in the game. Mirotic has been pretty quiet in this series with just 13 combined points. Taj Gibson should see more minutes, but he's battling a shoulder problem. The Bulls might get back backup guard Kirk Hinrich here. He hasn't played yet in this series due to a knee problem. The Bucks give the Bulls problems defensively but they just have no major offensive threats to scare anyone. Milwaukee shot only 35.6 percent overall and 4-for-17 from long range in Game 2. Khris Middleton led the team with 22 points, and only one other player had double digits: Michael Carter-Williams with 12. Giannis Antetokounmpo was just 2-for-11 from the field and Ersan Ilyasova 3-for-10. The Bucks scored 103 points per 100 possessions during the regular season but in these two playoff games have scored just 91 points per 100 possessions. They had a scant 13 assists in Game 2, two fewer than any regular-season game. Updated series line: Bulls -7000, Bucks +2000. Key trends: The Bucks are 9-1 ATS in their past 10 Thursday games. The over is 8-3 in the Bulls' past 11 road games. The home team is 5-0 ATS in the past five meetings. The under is 5-1 in the past six. Early lean: Bucks and under. Golden State took Game 2 on Monday 97-87, rallying from 13 points down in the first quarter. Klay Thompson had 26 points and Steph Curry 22. Thompson broke a 71-71 tie on the Warriors' first possession of the fourth quarter, grabbing an offensive rebound before throwing down a one-handed dunk. The Warriors never trailed again. Draymond Green showed why he's a top candidate for NBA Defensive Player of the Year. The Warriors led 88-84 when Green re-entered the game with 5:17 left in the fourth quarter, and the Pelicans scored only three points the rest of the way. The Warriors didn't play great, shooting just 9-for-30 from long range and 44.2 percent overall. Still, it was the team's 20th straight home win, and the Warriors are 42-0 this season when holding teams under 100 points. Pelicans star Anthony Davis had 26 points and 10 rebounds, but he was 9-for-21 from the floor and clearly was fatigued in the fourth quarter as he played 45 minutes. The Warriors keep throwing Green and Andrew Bogut at him. The Pelicans shot only 37.8 percent. Guard Tyreke Evans was questionable for the game but did play and had 16 points, 10 rebounds and seven assists. Point guard Jrue Holiday also was questionable for Game 2, and he didn't play. I believe he will in Game 3, but he can't go more than 20 minutes or so. New Orleans was 28-13 at home this season and beat every other Western Conference playoff team in the Smoothie King Center except Portland, which only visited once. Updated series line: Warriors -16500, Pelicans +4000. Key trends: The Warriors are 0-5 ATS in their past five games. New Orleans is 5-0 ATS in its past five at home. The under is 4-1 in the past five in New Orleans. Early lean: Warriors and over.